It all started in Sherwood Content, a small rural district a few miles outside Falmouth, Jamaica, when Usain Bolt’s teacher spotted him as a highly talented runner. Yet, she might not have envisioned that he was destined to become a phenomenon, an international household name. His performances have defied all logic. “He is too tall to run that fast; this is not supposed to happen,” is just one example of what the pundits have said. So, when he started out as a 200m-400m specialist, who could have known that the best was yet to come? 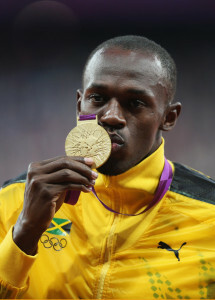 Bolt’s 2003 CARIFTA Games Under-20 quarter-mile record stood for six years until 2009. Back then, too, the nicknamed Lightning Bolt could run an excellent 100m dash. Small wonder that he was a key member of his high school’s and Jamaica’s junior sprint relay teams. In 2003, when the then 17-yr-old ran the back stretch for his school, William Knibb High, in the Small Schools category at the Penn Relays in the US, the crowd realized it was he, only after they stood in awe of the lightning speed of the flying tall figure in white uniform. But as the shouts of “Bolt, Bolt” started to travel around the stands, Bolt had already passed the baton, and William Knibb had secured a commanding lead that gave them victory. In 2005, expectations were high for Bolt to move up to the higher echelon of the sport, beginning at World Championships in Helsinki that year. Seemingly not ready for the then top-of-the-world Justin Gatlin of the USA, with whom he was up against in the 200m final, Bolt slowed to a jog because he felt a twitch, and at the end of his ceremonious run, in his youthful exuberance, gave Gatlin a big congratulatory hug. It had not been smooth strides to success for the fastest man on the planet. Having relocated to the City of Kingston for training purposes, the young teen developed an affinity for fast food and the fast life. As a practical joker, he would sometimes disappear before a key race. Later as he developed into a young adult, he was criticized for partying too much and not taking training seriously. His rise to stardom really began when he clocked 9.76secs for the 100m in Kingston (May 2008) based on just his 200m training. A week later, he broke compatriot Asafa Powell’s world record in New York, defeating the American record holder Tyson Gay in the process. The 6’5” phenomenon then broke his 100m record again (9.63), as well as Michael Johnson’s 200m world record at the summer Beijing Olympics (19.30). At the Berlin World Championships in 2009, he delivered a repeat world record performance (9.58 and 19.19, respectively). In 2011, Bolt false-started in the Daegu World Championships 100m final and was ejected from the line-up. The following year, London awaited his promise of a 9.4 world record in the 100m following his defeat in the sprint double by his training partner Yohan Blake at the Jamaica Nationals. He did not break the record he promised in the 100m but came close enough with 9.63, clocked 19.32 in the 200m, and anchored the 4x100m in yet another world record time of 36.84. The personality of this occasional DJ and big fan of reggae music sets him apart from others in the sport and makes him the most well known and exciting track and field athlete of all time. Just check the millions of fans who follow him on the social media.